I'm going to start my review with a disclaimer--this is my favorite beer, period. If I had one last beer to drink before I went to the grand bier stube in the sky, it would be this one. Appearance: When poured correctly, this beer looks magnificent in the glass. Topping off the head with the remainder of the bottle makes this beer a real treat. The color is a typical hefe yellow-gold and the cloudiness of the yeast masks the mystery of the taste inside. The thick head stays for a long time, so get used to drinking the beer through the head, you'll have to wipe your upper lip often. Smell: The aroma is very welcoming, never bitter or skunky. A little fruity, but understated, not like a lambic or some of the other fruity beers. Taste: As I stated earlier, this is the best bier in the world (my opinion). It is refreshing, fruity (not much), and very satisfying. No bitter after taste, leaves you refreshed and ready for more. Mouthfeel: Again, no problems here. Drinkability: The problem with this bier is that I can keep drinking it--over and over and over. I've had this beer on tap and a bottle. When I get it in a bottle I always pour in a glass, I've found that leaving it in the bottle keeps the foamy head from receding. On tap well let's just say its great could drink from it all day, "can I get another one please. "I was on my third one while my friend was on his first. It's a filling beer, so don't eat to much otherwise your belly will be paying dearly. I've drank other weisse's but none compare to this one. I prefer the Dark Weisse but its hard to find around here. The friends and family I've given to try say the same thing all the time. "It's smooth, tasty, sweet, heavy, but above all stronger than what they drink." Like I tell them "get drunk tonight not the next morning". All I need to do now to complete the experience is get a Weisse glass, it would put the cherry on top of this wonderful desert. Availability: depending where you are its available from gas stations to bars, some grocery chains carry them, pricing can be fluctuate accordingly so I recommend to drink it with a couple buddies, if you feel the price is steep. Taste: superb, you know your drinking great beer when alcohol is the smooth criminal in there, this beer does not need a garnish. Banana nut bread anyone? After effects: As someone told me a great clean beer that you can wake up tomorrow morning feeling great. Awesome beer. Nice smell, great taste and goes down unbelievably well. Pours a hazy golden color with a massive head that eventually settles down without much lacing. Smell is AMAZING - spices and bannana. The smell is nice but difficult to pick up, especially after the first sip. Taste is of bananas but that doesnt do it justice - just tastes awesome - kind of how a banana popsicle tastes way better than a banana. Great mouthfeel, beer is super smooth with a nice aftertaste and the drinkability is through the roof. Just a great allround beer. Taste...malty..toasty..rolls around on the tounge...sweet...no bitter...very good. Feel...like I could put away some of this! Smooth...not overpowering in any one thing...put together very nicely...highly recommend for your Weiss beer experience. I could drink this beer all day. I have had it on tap, with a lemon wedge, and that is great, but mostly, I can only get it in a bottle. The head is thick, and eventually desolves to a lace. The appearance is dark amber, and sort of cloudy. The smell and taste have a light hint of citrus, and a spice that I can't peg, since I am new to describing beer taste. I normally serve it in a tall weiss beer glass, at room temp. On a hot day, maybe cool it for awhile, and it really hits the spot. poured out a very thick foamy head and a cloudy lemon-ish orange color with darker hues swirling through out. took a while for the foaminess to settle down. Aroma was musty, fruity and I hate to say but smelled a bit like a wet dog. It had an slight apple and sour note and finished with a bready musty end. mouth feel was soft and chunky. It was an ok beer, but I felt one would do me just fine. Poured from a bottle into my Ayinger Weizen glass. Appearance: Very cloudy orange color with a nice head that slowly dissipates with lots of sticky lacing. Smell: Banana, cloves, wheat, heaven. Taste: You get it all: banana, wheat malt, cloves, slight lemon, a little pepper. Drinkability: This is so tasty and and easy to drink. I can drink a six pack before I know what has happened. 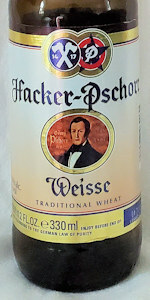 So stoked to finally have Hacker Pschorr available in Las Vegas! By far the best Weisse beer on the market. Great head on the pour. Strong sweet smell. Great cloudy unfiltered look. Taste is crisp and refreshing. Highly recommended to any hefe drinkers this is an original munich weisse beer. Also had it on tap. Also very good, but the 500 ml. bottles are the best. Must be served in a proper, what I call, a weiss beer glass, tall and tapered that can accommodate the full 500 mls. It is somewhat of a acquired taste, but once acquired, it's tough to beat. Already smacking my lips! Beautifully full bodied, aromatic, golden wheat, beautiful coloration, with a very satisfying full bodied, and full flavor, of just the right amount of balance between, not to sweet wheat, with a slight mild bit, not bitter, very slight, not to much of a fruity style flavor, with the unfiltered yeast adding to and making of the full body, with a medium weight making this Weiss a very satisfying to the pallet and excellent taste. Very aromatic to the scenes. O - Easily one of the best examples of the style. Highly recommended. World class wheat beer. One of the best I have ever had. Rich, sweet and very mild bitterness. Hazy pale gold in colour. Pours with a rich, thick head along with good glass retention and lacing. Love this stuff. A - Pours golden-yellow, lots of head, dissipates slow. S - Honey, bananas, cloves, and malts. T - Same as smell. M - So good. Light hops balance the taste. Hops not bitter though. D - Best hefeweisse I've drank. So delicious, will need to pick up more. Smell: Fruity as all hell...banana the strongest. Cloves, bubblegum, all the expected aromas. Has a touch of spiciness too. Mouthfeel: Crisp and refreshing with a medium, oily body that goes down really easily. Drinkability: Way up there... This is my first time trying anything from Hacker-Pschorr and I'm quite impressed. Give me a warm summer day, a deck to relax on, and a big glass of this and I'm a happy man. I've had this before, but in a bottle. It's a bit more enjoyable from the tap, though. The appearance is good. It pours pale yellow...not quite as cloudy as other hefes. The smell is good, still sweet with a hint of citrus. The taste is good, just not quite as flavorful as other hefes...but still a great brew. The mouthfeel from the tap is very nice...it's a bit more smooth than it comes in the bottle. The drinkability is high...great taste, smooth feel... could drink it all night. (The bar where I had it, served it with lemon...and it was ok with the lemon...but better without it IMO. I also had it with an orange slice...and that was a nice compliment...BUT I'd still take it without fruit). Pours a hazy dark orange color with a moderate sized off-white head. I just had the Paulaner the other day and this has several similarities (although I'd prefer the Paulaner). Sweet citrus aroma with a hint of banana and spices. Quite refreshing and very smooth. Very nice for a warm day. Flavor is a lot like others I've tried in the same category recently. Sweet (not too sweet though), with some vanilla, banana and citrus notes in there. All very well balanced. Massively cloudy orange brew with touches of brown here and there. Nice big white head that stays well where it should. Spicy and sour fruity bubblegum aroma with a little clove. Spicy and tart on the palate as well. Lots of banana. Sour maltiness dominates the middle and clove shows up in the back. Spiciness makes the tongue tingle. Delicate, but it has that nice spicy punch at the same time. One of my favorites of the hefeweizens I've tried, but oddly enough, it's not a style that I've delved into quite as much as others, so I'll have to see how it stands after I try more. I'd definitely have a few more of these! Serving glass: Poured from bottle into Summit Weizen/Pint hybrid. Appearance: Very cloudy light orange with a moderate white head that lasts awhile. Nice lacing. Smell: Cloves, slightly tart wheat, and mild banana. Taste: Major cloves upfront, with wheat malt and a touch of banana - slightly tart overall. The cloves carry through to the end of each sip and beyond, with pepper and lemon as well. Feel: Moderately high carbonation, light to medium body, exceedingly dry. Drinkability: Great German Hefeweizen that is very dry and just tart enough to be extra refreshing. This has to be one of the ideal lawnmower beers.